My own character was the thorn in my side. I felt the ache and didn’t shy away or try to hide. For the agonizing love I let out a scream. But for her to understand, it would take more than courage and words. You teach me now how cruel you’ve been — cruel and false! Why did you despise me? Why did you betray your own heart, Cathy? Why couldn’t you give me your love? Without you Cathy, my love is trapped in the grave beyond. I tried to make her mine. She was after all Heathcliff’s prized possession. Alas, I could only be laid in her tomb, my love being buried with me. Had I lived to see this day, this would have been my confession. PS 12th Contribution to NaPoWriMo. This is in line with the theme for today which is about writing a persona poem. 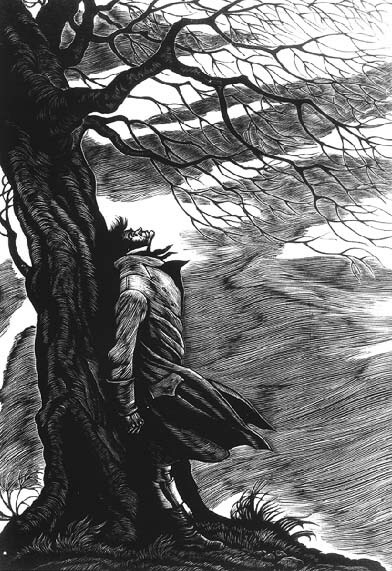 I chose my favourite character from my most favourite book Wuthering Heights. This entry was posted on April 14, 2013 by mitchellez. It was filed under Love, Misery, NaPoWriMo, Uncategorized and was tagged with Bronte sisters, Heathcliff, life, love, NaPoWriMo, poem, Wuthering Heights. Wow, beautiful, moving and what a powerful picture you paint. This was powerful. I wanted to attempt something on this theme. But somehow I am bad when restricted. You did it so well. Evidently, this is one of your favorite books, like you said the other day. Speaking out from another’s voice is not as easy as it seems, but you are one with the characters so much, its like you knew the beating of their hearts. Well done. Keep the ink flowing. I love Heathcliff! Absolutely LOVE him.